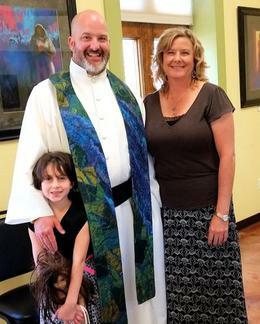 He is currently serving his second year as pastor of First UMC. Before that he served ten years as pastor of Living Waters UMC in Centerton, AR. He is a veteran having served as Navy chaplain for fifteen years with a one year deployment in Iraq as well as deployments to Thailand, Japan, & Crete. He is married to Marilou Shreve(pictured) and has an eight year old daughter. As a reconciling congregation, we are committed to equality and full inclusion in all aspects of the United Methodist Church for all persons regardless of race, gender, age, physical or mental ability, sexual orientation, gender identity, nationality or economic status. To learn more about Reconciling Ministries Network, click here. In the late 18th century a man named John Wesley began to preach outside of churches in England which led to a movement known as Methodism. Methodism was based on the teachings of Wesley including the belief that God loved everyone and that salvation was for everyone who freely chose it. This was counter to the ideology and religion of the day. This movement took off across the Atlantic Ocean in what was then Colonial America where the official church was the Church of England which refused to accept the teachings of Wesley. This led to many small groups meeting outside the church in homes. Eventually, war broke out and the English priests left the colonies and disserted the churches. This was a problem for the people in the colonies because Wesley taught that they needed a minister to receive the Sacraments, so Wesley commissioned emergency elders to go to the colonies and administer the churches. In 1784 on Christmas Day in Baltimore, MD the elders that Wesley commissioned joined together with other ministers of the church and held a conference to form the Methodist Episcopal Church. At that point, numerous ministers were bein commissioned as "circuit riders" or travelling ministers who would travel to cities, towns, villages and sometime very remote places to build churches and administer the Sacraments. Many began coming to Arkansas in the early 1800's several decades before Arkansas was a state. A Methodist Episcopal Church, South was organized in 1879 in Eureka Springs the same year the city was created. The first meeting place was a small house on Eureka Street then the church moved to an upper room of a building in the heart of Spring Street. In 1901, the Board of Stewards successfully undertook a difficult project, moving the church building to a more accessible site on Spring Street. In 2001, the church moved to its current location on Hwy 23 and finished the expansion of its building in 2013. After several unification of churches culminating in 1968 the name of the church was changed to what it is today, “First United Methodist Church”.